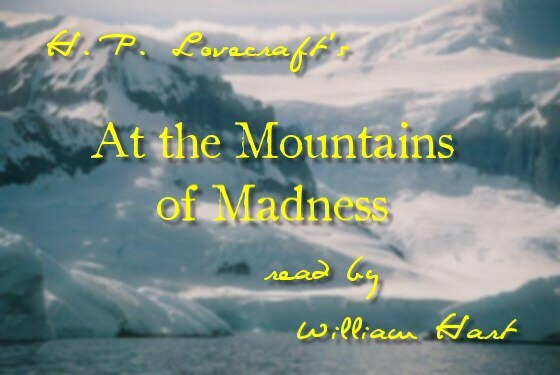 H. P. Lovecraft’s, “At the Mountains of Madness” Chapter 10 Read By William Hart Is Now On YouTube! Chapter Ten of “At the mountains of Madness,” has now joined Chapters 01-09 on YouTube! Check all of them out, and let me know what you think of this idea for getting Lovecraft’s unabridged works to a more video oriented crowd over at YouTube; and also as a way to bring some of them back here to discover more Lovecraftian items and links. O.K. I’ll get back to my work on Chapter Eleven. This entry was posted in 1920's, 1930's, 3D, At the Mountains of Madness, Audio, Audio Book, Audiobook, Book, Books, Elder Ones, Free, Guillermo del Toro, H. P. Lovecraft, H. P. Lovecraft Updates, James Cameron, MP3 Files, Mythos, Old Ones, Readings, Universal Studios, Video, William (Will) Hart, YouTube, YouTube Updates and tagged 1920's, 1930's, 3D, At The Mountains of Madness, Audio, Audio Book, Audiobook, Book, Books, Cameron, del Toro, Elder Ones, Fiction, Free, Guillermo, Guillermo del Toro, H. P. Lovecraft, Hart, James, James Cameron, Lovecraft, MP3, Mythos, Old Ones, Readings, Studios, Universal, Video, William, William Hart, YouTube. Bookmark the permalink.